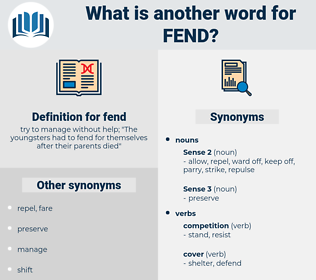 What is another word for fend? try to manage without help; " The youngsters had to fend for themselves after their parents died"
defend, manage, avoid, Avoiding, stand, prevent. disregard, leave alone, forget, abandon, ignore. besiege, bombard, cave, beset, submit, capitulate, overrun, storm, assault, assail. Habituated from their infancy to passive submission of body fend mind to their kings and priests, they are not qualified, when called on, to think and provide for themselves; and their inexperience, their ignorance and bigotry, make them instruments often, in the hands of the Bonapartes and Iturbides, to defeat their own rights and purposes. 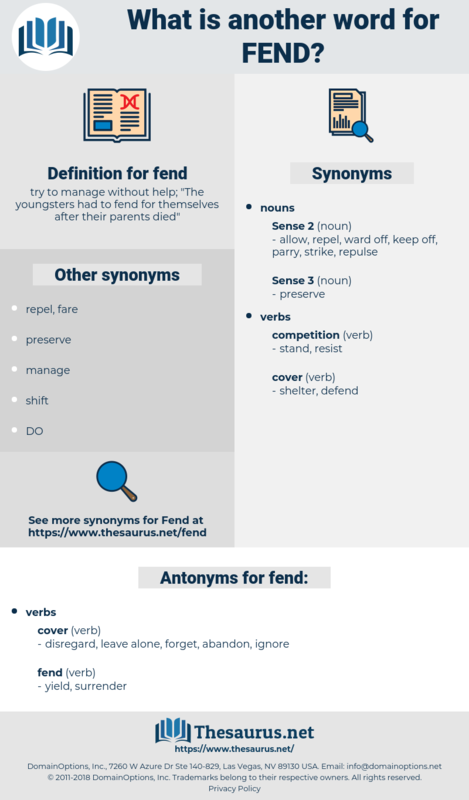 fine-tooth, founded, femininity, fondu, funded, faint, feint, fanweed, fomite, fan out, fine-toothed, faineant, Finnan Haddie, finite, fined, fond, fount, found, foment, find, fund, fonda, fumed, font, find out, fondue, Famed, fanned, fiend, five-pointed, finitude. fight, oppose, fight back, defend, fight down. get by, manage, contend, make do, make out, deal, grapple, cope.